Everyone has a reason behind their favorite grocery store chain. Maybe its the chain you grow up with, or one with lots of free samples. Or, maybe it's because you value the fact that they're blindly puritanical about the kinds of things they'll write on cakes. Well, now we know just which ones the most Americans prefer thanks to a spankin' new survey that reveals the most popular grocery chains in the US. In the haze of Hollywood awards season, a slightly different industry has recognized some big winners thanks to the folks at Dunnhumby, whose 2019 Retailer Preference Index just revealed the list of America's favorite grocery stores, and some of them might be a bit surprising. The findings come from an online survey of 7,000 US households combined with publicly available financial data, which helped suss things out. This year, Trader Joe's tops the list as the favorite chain, followed by Costco, and then Amazon (aka Whole Foods). Here's how the top 13 shake out. In a year that saw Amazon throw itself even more into the supermarket space by trying to bridge the digital shopping experience with brick and mortar retail, the fact that TJ's took the top spot may come as a surprise (maybe not so much to those who've waited in a line there that wraps literally around the store). However, its position as the country's favorite seems to suggest that its precisely the brand's straightforward in-store experience, focus on private brand offerings, and consistently low prices that earned it the bragging rights. "With its small format, lack of Digital shopping and limited national brand offering, the retailer focuses on speed of in-store shopping and having a rich private brand offering," the report explains. "This bricks and mortar only, private brand approach minimizes costs and keeps prices low, allowing them to pad margins and reinvest in customer service, product quality and in-store experience. 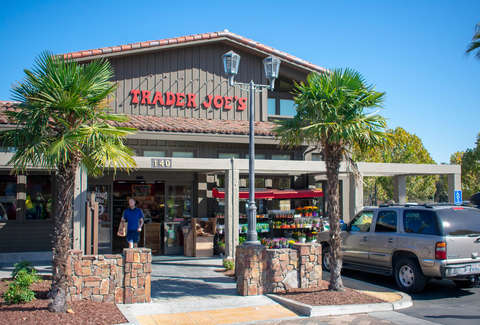 This strategy sacrifices reaching customers through a growing digital channel and breadth of assortment – particularly in non-food items – and therefore Trader Joe’s loses on one-stop shop-ability and convenience. However, this loss is also their gain, since it allows them to be excellent at what matters most to their customers." In short, the fact that it doesn't try to be everything for everyone means its able to more nimbly pull off what it's best at. The Dunnhumby survey also took a look at a some more specific metrics to rank American grocery stores in other terms. For instance, in terms of chains with the best prices, ALDI came in at number one, followed by Market Basket, and then WinCo Foods. As for the overall "quality," Wegmans took the top spot, with The Fresh Market and Trader Joe's coming in second and third, respectively. But why get all fussy about best price or quality when all you're really looking for is some affordable cookie butter and cauliflower pizza?